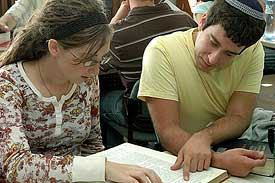 Want to spend 3 exciting weeks in Israel studying Jewish texts, meeting new friends, living in Jerusalem? Enrollment is open at Pardes for their 3 week summer program. Open to ages 20 and up (19 if you've got a year of college under your belt). So go click and request more info from Pardes as they will be happy to tell you more, and you'll have a great lifelong experience in Israel. Normally we wouldn't reprint an article in whole from a newspaper, but this will be the exception. 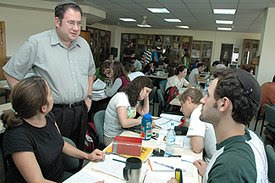 On March 6, 2008 - a year ago in the Hebrew calendar - Avraham David Moses was one of eight yeshiva students murdered as they sat in the Mercaz Harav library learning Torah. Alaa Abu Dhein, 26, from the Arab neighborhood of Jebl Mukaber in eastern Jerusalem, entered the yeshiva armed with an AK-47 just as preparations were under way for a celebration marking the new Hebrew month of Adar. Hearing gunfire, some students mistook the sound for fireworks. Entering the library, the terrorist opened fire, splattering blood and books everywhere, instantly killing five of the eight students destined to die that evening. One of them was Avraham David Moses, 16. His mother, Rivkah Moriah, had started life thousands of miles and worlds away, in a loving New England Christian home, and her story links communities of Palestinians, Christian Americans and Orthodox Jews. IN 2002, AN ARAB village near Efrat began to pay the price for refusing to attack its Jewish neighbors at the behest of its Palestinian brethren. The Jews of Efrat had been kind and decent to these Arabs, who now refused to engage in shooting and rock throwing at the cars traveling in and out of Efrat. When the government erected protective barriers along the roads, many Arab villages were cut off from supply routes used to transport everyday essentials, and now had to rely on their greater community for delivery of basic necessities. But the community refused to supply this particular village, because the inhabitants had not participated in the terrorism against their Jewish neighbors. Efrat resident Rabbi David Moriah became aware that the neighboring villagers were suffering from malnutrition. Gathering volunteers, he prepared and personally delivered food packages to the stranded village. In so doing he developed a rapport with "Abdul," a Palestinian who had often traveled to Efrat seeking work as a handyman and a collector of used clothing. When the recently divorced rabbi and father of six mentioned that he was moving to a new apartment, Abdul offered to help him. He also wanted to introduce the rabbi to a nice Jewish woman. The rabbi needed a wife. BACK IN EFRAT, Rivkah Moses, a recently divorced mother of two, was also packing. She had come to Israel in 1989 as Martha Webb, a 21-year-old Quaker from rural New Hampshire seeking guidance on her path to Jewish conversion. She had become intrigued by Judaism after joining a Sabbath get-together on her campus at Oberlin College, just outside Cleveland, Ohio. "I went for the community aspect" she recalls. She found that, among other things, "the Jewish rituals sanctifying the mundane really spoke to me." The experience led her to seek lessons toward conversion with the campus rabbi, and then to switch gears. She opted out of her plan to spend an academic year studying Japanese in Kyoto and instead decided to attend the Machon Pardes school in Israel. Once fully committed to becoming a Jew, Martha realized that conversion was easier in the US than in Israel. She returned to Cleveland to work with her rabbi, and there met and fell in love with a Jewish man who was just discovering his roots, which included the fact that he was a kohen, a descendent of Jewish priests. Deeply in love, the couple traveled to Israel to seek the advice of a matrimonial expert, who sadly pointed out that Jewish law precluded any marriage between a convert and a kohen. The disappointing break up of her first love was a sacrifice for Judaism which would prove to be minuscule by comparison to the future sacrifice in the life of Martha Webb. Now living with her sons in Efrat as Rivkah Moses, she was picking up the pieces of her life, post-divorce. She had gone through a grueling process in which she had to satisfy a beit din that her commitment to Judaism was unwavering. "The judges kept asking me if I intended to continue the observant Jewish lifestyle." The custody of her two boys hung in the balance. "They never asked my husband that question. They just didn't trust that my conversion was for real." She finally managed to convince the court of the sincerity of her conversion, and the couple was awarded joint custody of their two children. Just before her move to a smaller apartment, the local Palestinian used clothing collector came by for his regular pick up. She knew Abdul to be a kind and well-intentioned fellow from the nearby Arab village. "Where is your husband?" He asked as he looked around, "Who is helping you move?" "I have no husband" she replied. "I am divorced." "Let me help you move" was Abdul's reply, "and I want to introduce you to a nice man. I can't believe that such a wonderful woman has no husband!" The Palestinian used clothing collector had just become the matchmaker for two Orthodox Jews. AVRAHAM DAVID MOSES'S appearance belied his nature. The fresh-faced blond-haired teenager was known for total devotion to his studies, almost to the exclusion of all other activities. He would keep his bright blue eyes on his books even while preparing salad. His intense immersion in Torah had shaped his character and moral stance to such a degree that his own mom was taken aback by his ability to control his temper, avoiding the occasional outbursts and episodes of rebellion most would expect from a teenager. "He had the ability to respectfully and gracefully disengage from a tense conversation. He just blew my mind," she said. "Shouldn't that level of maturity have come from me, as the parent?" Rivkah credits Yeshivat Yerushalayim L'tze'irim with helping shape his fine character. "Yashlatz," originally founded in 1964, is one of the leading national-religious yeshiva high schools, and shares a campus with Mercaz Harav. The schools aim to inculcate students with a love of Torah and commitment to the Land. Many alumni have gone on to be IDF officers, rabbis and Jewish leaders. Rivkah feels that the boys killed were among the top students, and would have gone on to be leaders had they not been murdered in cold blood. The shooting of innocent yeshiva boys shocked and saddened people from all walks of life. The boys' funeral was broadcast without interruption on TV. Striking to Rivkah was the outpouring of sympathy and support following the tragedy. "The reaction of Diaspora Jewry and secular Jews in Israel made us feel like they were with us, even if they didn't identify with our way of life. Everybody cared." Following the massacre, hundreds of people from all over the country and abroad visited the families of the slain boys. Among them were Jews from every spectrum as well as Arabs and Christian peacemakers. Many had crossed paths with Rivkah and her husband in their outreach efforts through the years. And there with his wife, stood Abdul, the Palestinian used clothing collector who had paired David and Rivkah Moriah. His eyes full of tears, Abdul apologized and expressed his shock and embarrassment that such an act of terror had come from his people. PERHAPS IF A PALESTINIAN like Abdul had never touched their lives, the couple would not stand by their belief that even now, the hope for peace still exists. Rabbi David Moriah says he and his wife have not given up on Jewish/Arab relations, though he fears there are fewer and fewer members of Palestinian society to work with. 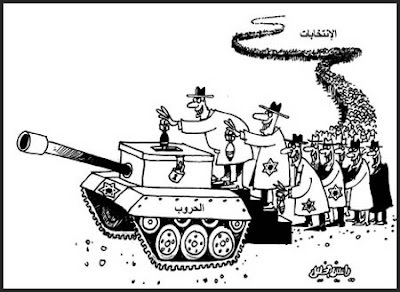 "It concerns me how violent the Arabs are within their own society. 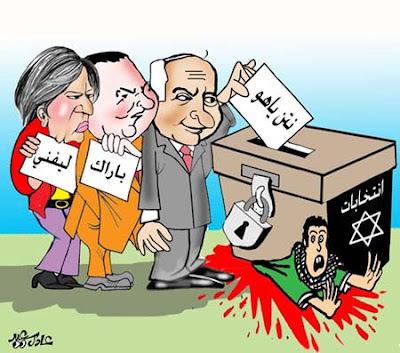 In Gaza, it is now legal to murder those who carry on negotiations with Israelis." But he also recognizes that there are many non-violent, well-intentioned Arabs. "We are still friends with Arabs, and we know there is a way to move forward. One must understand that it is a complex situation and everything you do can have an effect on future generations." 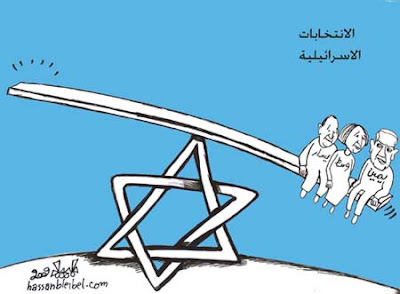 David feels that only with justice can Israel move forward in dealings with its Arab citizens and neighbors. No bad deed should go unpunished. "We must hate evil and show justice to those who perpetrate evil," he says, "while making every effort towards coexistence." Rivkah surprises the Christians she meets with her easy familiarity with their customs and terms, when she explains to them that she used to be a Christian. The formerly Quaker rebbetzin who teaches Orthodox brides the fundamentals of family purity is unwavering when asked if she has any regrets about aligning herself with the fate of the Jewish people and the lifestyle in which it placed her son. "Who he was, and who he pushed himself to become - he wouldn't have been if I hadn't been in the system." Rather than undermine her faith, Rivkah felt reinforced by all that transpired and all that she would go on to learn of her son's life and the lives of the other slain students. Though each lost boy was unique and special, beloved by the other students and teachers at the school, Rivkah remains confident that her son's school will go on to cultivate future leaders. The thoughts and prayers of those close to the boys have recently been published in a book entitled Princes among Men (Feldheim, 2009). Tonight is Rosh Chodesh Adar (the month of Adar) and that means that Purim is around the corner. We've got some fun stuff planned for our Muqata Purim Special. JoeSettler here (so you don’t blame Jameel for this post). I’m really getting tired of certain election-related shennigans, especially the one this post is about. Yes, the system is messed up, but the primary solution that keeps being put forward (increasing the threshold) is the ones that would ultimately exclude most of the diverse parties and deny a voice to significantly large sectors of the population. If they could get away with it, they really would try to create a 2 (or 1) party system in Israel, and not allow in anyone who doesn’t fit. Israel needs to go back to the 2 ballot race, where we vote for Prime Minister separate from the Knesset, but this time do it right. Grant Executive powers to the Prime Minister separate from the Legislative powers of the Knesset, and grant each branch certain veto powers over the other (and remove the ability to call for early elections, except in very limited cases). And then obviously we do not require a coalition to form a government. Each one will do their job, and if one decides to unfairly block the other, they will get it back in return with the other branch’s veto power. In the end, we’ll either have permanent deadlocks, or the opposing branches will learn to compromise and work together on important issues of national concensus (more likely). But no more cobbling together coalitions with all the extortion, horse trading, and other nonsense. What irks me right now is what Netanyahu is trying to do. For whatever reason, Bibi wants his National Unity government with Kadima, even though that is not the will of the people. But that isn’t the point of this post either. What really bothers me is the following – and this is the point of this post. Kadima received 28 mandates. Many of those mandates came from the far Left who wanted to block Bibi. There are serious backroom talks going on right now that at least 10 Kadima MKs may jump ship to the Likud!!!! Imagine you voted for Kadima and your votes went to the Likud, or think back to Oslo, when Rabin openly bribed two RW MKs to vote for Oslo, or Sharon stealing the entire government by creating Kadima, when we all voted Likud and for Likud stated policies. We, the voters, are getting openly cheated. 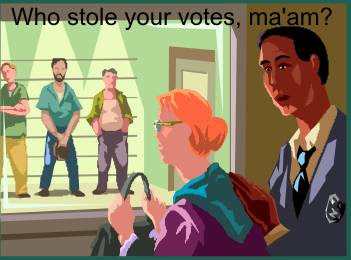 Our votes are being robbed in broad daylight. These mandates are not the personal property of these MKs. They belong to the parties that received the votes (as the party is all we are allowed to vote for). 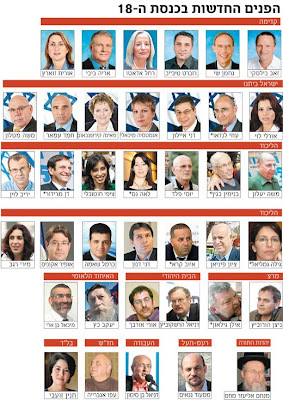 If these 10 MKs jump ship to the Likud, I will be among the first (I am the first in fact right now) to demand a national protest against this open vote stealing. I will demand the entire government be replaced. Streets should be closed. The Knesset should be picketed. There should be a national strike. This goes far beyond the typical bait-and-switch politics of our politicians. I don’t care, Left or Right, we the people voted for the parties we wanted in office. If an MK is unhappy, then let him quit, but he has no moral right to switch allegiances mid-term. These MKs didn’t win their seats, their parties did. It may be legal, but this is simply unethical. 8:09 PM Another positive outcome is that the Justice Ministry probably won't go to Dan Meridor and might instead stay with Daniel Friedman who will now have support for his Judiciary reform plans. 2:15 PM Despite now having clear support for a Likud-led Right Wing coalition, Peres will be meeting on Friday with both Bibi and Livni to try to establish a National Unity government as opposed to a Right-wing government that the voters clearly preferred. 12:07 PM Bayit Yehudi recommends Netanyahu. 12:03 PM Shas recommends Netanyahu. 11:03 AM Lieberman still adding conditions. Tells Peres he wants Kadima in the coalition. 11:00 AM Police announce they will be calling in Lieberman within the next few weeks for their investigation. 10:39 AM Lieberman folds. Announces support for Netanyahu as Prime Minister to Peres. 8:37 AM Well that's different. All the parties with their Leaders having been responsibly in Israel, met with Peres last night or today. 50 MKs came (or are coming) with recommendations for Netanyahu, but more unusual, 77 MKs stated (or are about to state) they won't recommend a Livni led government. Only at 10:30 AM a now much weakened Lieberman (from his inappropriate vacation) will say his piece to President Peres. But it won't matter much. 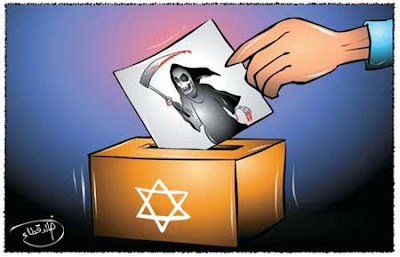 With the clear majority not supporting Kadima, Lieberman will be forced to join Likud, or be excluded in a possible unity government, or simple force the country into new elections at which point his party will disappear. The Jewish Home party is the first on the list of parties to meet with President Shimon Peres on Thursday. Party chairman Rabbi Prof. Daniel Hershkowitz is to arrive at the President's office at 9:00 a.m. for a 20-minute meeting, followed by leaders of Meretz and Balad. Israel Is Our Home (Yisrael Beiteinu) chairman MK Avigdor Lieberman is scheduled to meet with the President at 10:30. Next in line are leaders of Shas, Labor, Hadash, Ra'am-Ta'al, Ichud and Leumi (National Union). The last discussion is scheduled to begin at 6:10 p.m. with United Torah Judaism (UTJ). An admission of guilt miscalculation. Peres simply never stops being Peres. The latest Peresism is his thoughts on how the Gaza evacuation was done incorrectly. "Whatever will happen in the future, we shall not repeat the mistakes we made in leaving Gaza," Peres said in a question and answer session with a group of American Jewish leaders. "It should have been done otherwise. I was for leaving Gaza. I feel myself as one of the persons mistaken." Nope, in short, Peres is saying he is not sorry for leaving Gaza, he just now assumes that if we had left a different way then Hamas wouldn't have taken over! Meaning that Peres still believes we can kick out all the Jews from Judea and Samaria and hand over our security to someone else and the same won't happen again - if only we do it differently. Likud is finishing up signing an agreement with UTJ. With that (and excluding Lieberman) it means that Likud now has a solid block of 50 seats (Shas, Bayit Yehudi, National Union), while Livni has a mere 28 (Labor at 13 and Meretz at 3 said they won't sit with Lieberman and won't support Livni since she is considering it). That means that on Wednesday night Bibi goes to Peres with a solid lead over Livni, but still short of the mandatory 61 that he needs. As I've mentioned, Shas and UTJ would have a big problem sitting with Kadima-Lieberman as the their sole common denomonator is a civil revolution, not something those religious parties can abide by. At some point Lieberman must come back from his irresponsible extended vacation and decide if he wants to continue playing games or actually get involved in running the country. Of course, if there remains a deadlock situation, I wonder what happens next? Another election? Does Peres actually try to implement a rotation system? Does Olmert remain in power forever? It's certainly time we start separating the voting and powers of the executive and legislative branches, so we can get on the road to a normal and working government without these deadlock situations (the problem with the last time they did that, is that they only did it halfway). 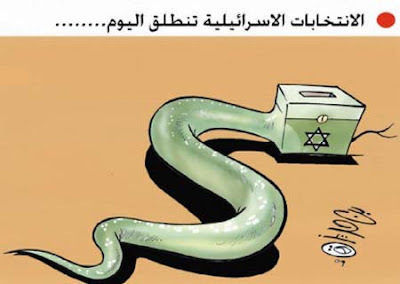 7:55 PM This cartoon appeared in Makor Rishon. It features Eli Yishai (Shas) and Lieberman sitting together at the government table. Yishai is asking about the Kashrut of the apple. 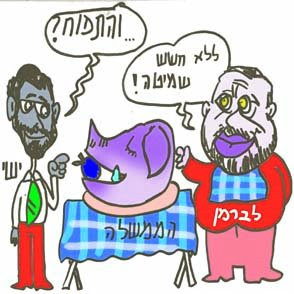 Liberman confirms that there is no problem of Shmittah, so it's OK to eat. Maybe we should send Spiderman into Gaza? 3:42 PM Spiderman Returns -- makes an appearance near Israeli city of Kfar Saba and Highway #6. For the second time in less than 24 hours, someone dressed as Spiderman (or Spiderman himself?) appeared at the Chorshim intersection of Highway 6 throwing ropes to swing around. Area residents reported this to the police who arrived, yet its unsure if the super hero was apprehended. 3:28 PM Why I don't conduct public readings from my blog. Reason #231 You have to be on the lookout for stabbers. A Chinese blogger whose satirical postings have gained a wide following was stabbed in the stomach at a Beijing book store after giving a reading, witnesses and friends said Monday. "A romantic relationship requires honesty between a couple," she told her interviewer. “I couldn’t, of course, develop such a relationship with anyone, but a short relationship does no harm, if you keep to the rules. "It’s a bit like forcing yourself not to get drunk in order to keep control of your mouth." Livni said she had been unable to reveal to even her closest family that she was a spy. When her father visited her in Paris, he could not understand why a woman who had been a brilliant law student "was wasting her time in Europe doing nothing". cloak and dagger tip: Rafi from LifeinIsrael. 11:22 AM UK Telepgraph blames Israel for the non-development of the underground natural gas fields off the coast of Gaza. I'm surprised they didn't outright blame the Cast-Lead operation on slander that Israel wanted to capture these fields. Then again, we're idiots for even suggesting this 2 billion dollar find should go to Hamas. 11:16 AM Mei Eden -- the Golan Heights Bottled Mineral Water company has halted shipments of their bottled water due to irregular results from their Quality Control checks. The company has stated that all of their products already shipped and delivered are safe to use. 11:11 AM So much news today. MDA HAZMAT Hazardous Materials) Mass Casualty Event at the Club Hotel in Eilat, due to chemical leak of some sort. 25 lightly and moderately wounded transported by Magen David Adom to YosefTal hospital in Eilat. 3 Rockets fell so far on Israel (1 last night, 2 this morning). No injuries...damage caused to fence around community in the Western Negev. 5:40 PM Lords of Misery -- A new documentary on UNRWA's doctrine of encouraging hate. 3:56 PM Rocket Fired at Western Negev. No injuries or damage. And now...back to the upcoming government? Rumors of secret negotiations abound -- between Likud and Kadima. Netanyahu would be Prime Minister, and 9 government portfolios would go to Kadima, including the Foreign and Defense Ministries. 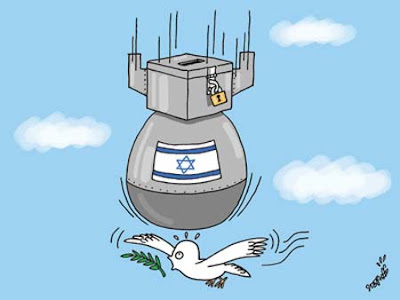 Isn't it interesting how 2 weeks ago Kadima and the Likud were blasting away at each other: Livni isn't capable of being Prime Minister, Netanyahu is a chronic liar, Livni would never sell out to the Chareidim, Netanyahu as Prime Minister would mean instant Armgeddon? And now... it's possible that we'll soon see a Likud/Kadima government with all of Israel's religious parties? Anything and everything is possible in Israeli politics. The debate whether Lieberman went on his overseas trip (to Eastern Europe?) in the middle of coalition negotiations was to oversee one of his alleged private business ventures (which rumor says is part of what he is under investigation for) or just to strong-arm Netanyahu and show him who’s boss, may very well now be irrelevant. Likud and Kadima are holding serious talks, and you can bet the one common denominating factor that joins them is the desire to not be held captive to the games and extortionist tactics of Avigdor Lieberman. It would appear that Lieberman overplayed his hand in the presumption that he and he alone held the keys to the government in his pocket. Taking his vacation while rockets fall on Israel may have been too much for everyone to stomach. It is has become clear that both Likud and Kadima have realized that any government Lieberman enters on Lieberman’s terms will be inherently unstable and under a permanently loaded gun to the head. And even if a unity government doesn’t form from these negotiations, Lieberman has been significantly weakened, as it’s now recognized that a coalition can be formed without him if needed. The most likely constellation in this case would be Likud (27), with Bibi as Prime Minister, Kadima (28) with Livni as Deputy Prime Minister and many senior positions, Aguda (5) (giving them 60), and Bayit Yehudi (3) for good luck. Shas (11) may be invited in immediately afterwards but it will be for further stability and not because they are needed. Ichud Leumi (4) may be out, as per the demands of Kadima, but Lieberman will be out in the cold for sure. In the long term would such a government be viable or accomplish anything? Perhaps, perhaps not. And even if it did, what would it accomplish? Whose agenda would it follow? One thing is clear. 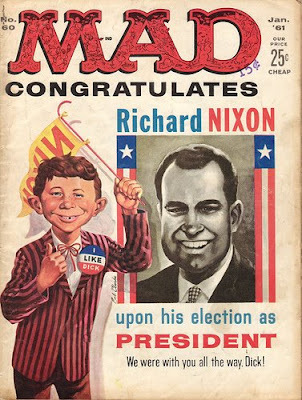 Lieberman, with his loaded gun, shot himself in the foot, as well as the rest of the right-wing/religious electorate that actually won this election. ...except for the 2 Kassams and mortar fired on Shabbat, the bomb near the Gaza security fence, and the Grad missile that just missed Kibbutz Yavneh (and the farthest strike since Israel pulled out before the elections). Saturday night firebomb attack in Gush Etzion. 8:34 PM On Channel 2 TV tonight, we were shown different ballots that were cast by soldiers and the others. 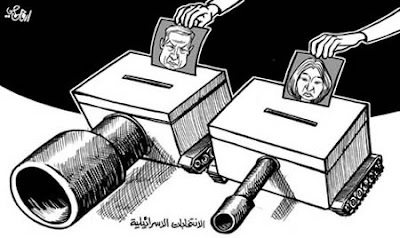 Many soldiers wrote "Gilad Shalit" on their ballots. 7:12 PM Final Election Outcome: No change at all in any of the seat allocations after counting all the votes from soldiers, diplomats, hospitalized, maritime people, and criminals. Same as what I reported a few hours ago, but now it's official. 5:22 PM Update; Reshet Bet/Channel B radio reports that the official results will be announced at 6:00 PM -- only 38 minutes from now. 5:19 PM The Israel Knesset Elections Committee will hold a press conference at 7 PM Israel time, to announce to final results of the election. All media sources are reporting there are no changes, so a big "press conference" just seems like a waste of everyone's time... Will keep you all posted in case anything interesting develops. 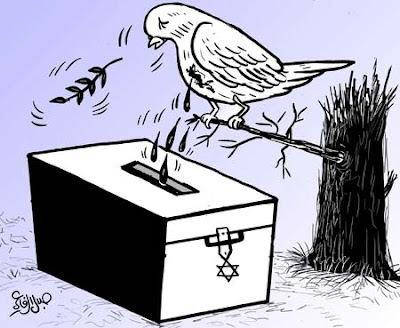 4:49 PM Haaretz reports that according to sources inside the election committee, after the final counting of the absentee/IDF soldier ballots, there is no change in the seat allocations per party. These are unofficial statements...unsure when final announcement will be made. 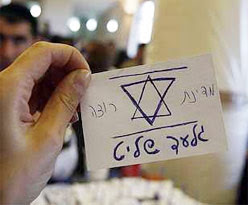 Pictured at right is a Reuters photo of a ballot cast for captured IDF soldier, Gilad Shalit. 3:33 PM Dozens of soldiers voted "Gilad Shalit"
3:11 PM Rumors flying everywhere of what the final results are. 2:56 PM The votes have been counted...the final analysis is being done now to determine any changes in the political spectrum...stay tuned. 12:51 PM Meretz leader slams Kadima and their "false campaign." Meretz Chairman Chaim Oron said to Ynet that his party will not recommend the president to place the responsibility of putting together the cabinet neither to Livni nor Netanyahu. 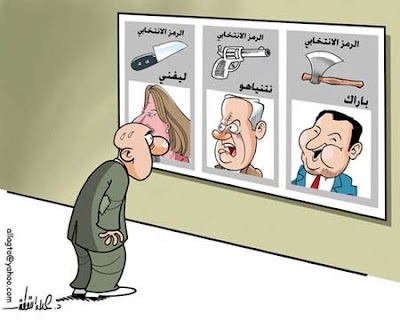 "We said even before the elections that if Livni goes into negotiations with Lieberman, we will not recommend her. Oron responded to his party's performance in the elections, saying, "We will hold a long series of talks, and will try to analyze. It is clear that there is a partial answer – what happened in the last days of the elections with Kadima's very successful false campaign." Kadima will suggest to President Peres that Tzippi Livni should govern a leftwing government comprised of Kadima, Labor, Mertez, Shas, and UTJ -- a total of 60 seats, with support from the 11 Arab seats outside the government. When asked if this was "going against the will of the voters, who voted for a rightwing majority", Shitrit replied, "with all due respect, the voters are stupid." 11:46 AM The 150,000 outstanding votes from the 18th Knesset election are being tallied now, and should be completed by the afternoon. The Israeli election board will release the results this evening. 10:50 AM Kadima MK Meir Shitrit on Channel B Radio this morning: "With all due respect, the voters are idiots." 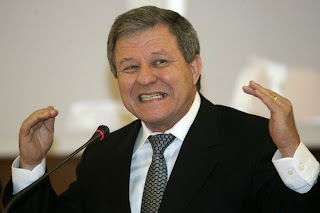 "The leftwing lost the election by THIS much"
"I want to squash stupid Israeli voters like this"
"But we were this close to signing an agreement with Hamas..."
9:13 AM The 18th Knesset will have 31 New MKs. 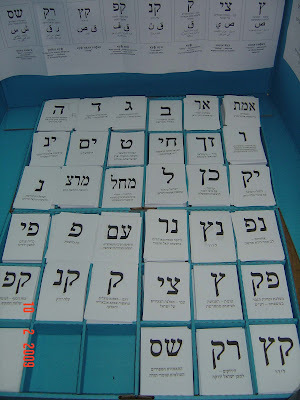 9:11 AM IDF Galei Zahal Radio reports: The additional 150,000 votes should be tallied by this evening. 9:06 AM Walla reports that Livni is finding it too difficult to put together a coalition, and is going to ask President Shimon Peres current wheeler-dealer PM Ehud Olmert for "help." Shows really excellent leadership qualities...she can't even form a coalition without the help from Peres Olmert. 1. Labor insists on being in the opposition to rebuild itself. 3. Arab parties announce they will not recommend Livni as Prime Minister candidate to Israel's president. Likud; Livni should wake up from her dream that she's going to be Prime Minister. Reports: Livni offered Leiberman job of substitute Prime Minister (she she's not around), and any ministry of his choosing. Shots fired this evening at Jewish motorists near the "Ateret" settlement in the West Bank. No inuries. Rocks and Molotov cocktails thrown this evening near the community of Maaleh Shomron on Road 55 in the West Bank. No injuries. Palestinians report that an failed assasination attempt was made today on Hamas leader Isma'eel Hani'eh. As Israel tries to make heads or tails of yesterday's as of yet incomplete photo-finish elections, I stopped to fill up my car this evening at the "peace" gas-station. Everything is named for "peace" these days in Israel, so a gas station named "peace" shouldn't sound so odd. I started filling up my car with gas, and the Arab station attendant, "Bassam" clearly stated on his name tag, approached and asked if I wanted a bottle of windshield washer fluid -- the day's special sale item. Shaking my head, "sorry, not tonight," I replied. He understood, and started to walk away, when he stopped, pointed to the road and asked if I knew why many police cars were driving by. It took a second to comprehend why he was asking me of all people, and then I realized my volunteer EMT jacket must put me in the group of people who appear to be "in the know," if police cars are driving around. I checked my pager to see if I had missed anything "big" in the area, and said, "looks like everything's ok, Baruch Hashem (Thank G-d)." He smiled, and replied, "Hamdil l'Allah" (the Arabic equivalent of Thank G-d). My car was still filling up on gas...so I asked, "So, did you vote yesterday?" He got very excited and animated about my question. "Yes, yes I voted, I voted. I personally took 15 family members to vote." "Who did you vote for? Did your party get in?" He excitedly replied, "Yes, yes, they got 3 seats." He gave me a strange look. "No, No, I voted for...," and stated something in Arabic I couldn't recognize. "No. One minute please..." as he ran off to inside the station, returning seconds later with the day's newspaper. "Here," he showed me. "This is the party I voted for," as he proudly pointed to the Raam-Taal party. He again gave me a quizzical look, and said "I only know the letter of the party...not its name". He asked me who I voted for. Also smiling, I replied, "Likud..."
He nodded with a grin. "Democracy, isn't it a great thing?" I asked. My car finished filling up with gas, he wished me a good night, and off I went...back to my settlement in the Shomron. There were still rocks on the road -- thrown an hour earlier by Arabs at Jewish motorists, bits of glass from shattered windshields and the remains of a molotov cocktail burned into the road's asphalt. Jameel and I were talking tonight about large vs. small parties - it's getting a bit repetitive. At one point we discussed the percent of settlers in the population vs. what percent of the incoming Knesset we make up. We leave it as an exercise for our readers to name all the settlers in the incoming Knesset and to which parties they belong. Hoping to entice Avigdor Lieberman's Israel Beiteinu away from the right-wing bloc and harm Likud leader Binyamin Netanyahu's chances of forming a coalition, a Kadima official told The Jerusalem Post Wednesday that Israel Beiteinu was more of a natural partner than Likud, and that Lieberman's party was "not really in the right-wing bloc." "We've turned into a significant party, the third largest in Israel," Lieberman said. "It's true that Tzipi Livni won a surprise victory. But what is more important is that the right-wing camp won a clear majority... We want a right-wing government. That's our wish and we don't hide it." Yes, but apparently Kadima would like to dress him up otherwise. You can read more first thoughts on JoeSettler. Super Tuesday -- Israel Election Day Special Edition! 4:17 AM JoeSettler signing off. Good night/morning. Remember, these numbers are not final, and we will see the various parties going up or down a seat over the next day. What is clear is that the Right Wing/Religious parties have clearly won the majority in the Knesset. What also remains to be seen is if Lieberman really is a Right Wing party, or will Kadima be able to buy him off. 4:08 AM Kadima leads by only 35331. Far too close to tell with the still uncounted soldier's votes. We may not know who is the biggest party until Wednesday night or Thursday. It is still clear that the RW/Religious bloc is the majority. 4:00 AM YNET and Haaretz says that with 98.2% of the vote in Kadima 28, Likud 27, Ichud Leumi 4, Bayit Yehudi 3, Shas 11, Lieberman 15, UTJ 4, Labor 13, Meretz 3. 3:47 AM 3162613 votes counted. Kadima expands lead to 35378. Again my calculations say Kadima 27, Likud 26 (with a slight chance that Likud could be bumped to 27 seats). 3:14 AM The soldier's votes will only be counted on Wednesday. 2:49 AM 2801150 votes in. Kadima leads Likud by 30237. 2:33 AM 69% of the votes counted. 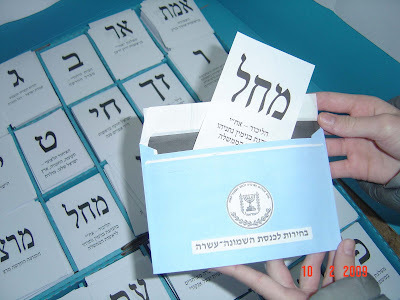 Estimated seats: Kadima 29, Likud 28, Yisrael Beitenu 16, Labor 12, Shas 11, Meretz 4, United Torah Judaism 4, Ichud Leumi 4, Hadash 4, Habayit Hayehudi 3, Raam – Ta'al 3 and Balad 2. 2:23 AM With 2374785 votes counted, Kadima now leads with 30048 (1.29%) above the Likud (before vote sharing and disqualified votes and parties). It looks like the effective difference between them is 1-2 seats. 2:16 AM Vote sharing: A number of parties have set up a paired vote sharing relationship. It effectively works out that the party that is closer to getting another seat will get the extra votes from it's partner's party that would otherwise go to waste - as long as the partner party passed the minimum threshold. Kadima's partner, the Green party, will not pass the threshold. Likud and Lieberman are partners, and one or the other could gain an extra seat. The same is true for Ichud Leumi and HaBayit HaYehudi (where it looks like I"L will get the seat). 1:53 AM 2043832 votes in, and Kadima's lead over Likud jumps to 22671 (but still 1 seat apart in percentages). It looks like Ichud Leumi may be up to 4 seats and Bayit Yehudi 3. 1:48 AM I found it sad but amusing that when reporting the results, the Israeli media defined the Likud and all parties to the right as Right wing parties, but Kadima and all the parties to the Left as Center-Left parties. Could they try to be a little more blatant in their worldview? 1:45 AM Kadima now has only 12,632 more votes than the Likud (before vote sharing is counted). 1:35 AM Now that's interesting. The gap between Kadima and the Likud is dropping. My calculations show them at just a little more than 1 seat apart, with nearly 50% of the votes counted. Will they be tied by morning? Kadima now has only 12,632 more votes than the Likud (before vote sharing). 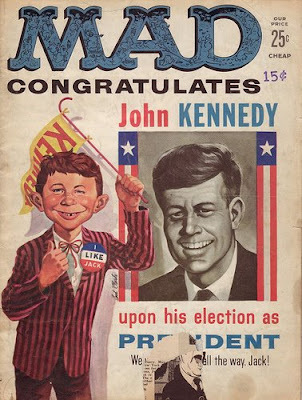 1:10 AM Put up a post called "Bittersweet" on JoeSettler, which I think accurately describes the results of this election. 43% of the votes counted so far. 12:41 AM Massive rainfall and hail on the Kinneret! 12:16 AM Just a reminder that what we are seeing now are exit polls, and only the beginning of the counting of the votes. The soldier votes still haven't been counted. This can result in a significant change by the morning. Not to mention the various vote sharing arrangements. 12:11 AM First of all, it is raining in Israel, and raining hard. More rain than we've had all winter long I'd say. 12:03 AM JoeSettler here. Will update post very soon. I will keep posting here, and we will do a new post in the morning when the final results are in. 11:00 PM I'm off to bed. Will be back on early AM to summarize actual results. 10:55 PM Live Actual Results can be seen all night long at the government election result website, here (sorry, it's in Hebrew only). 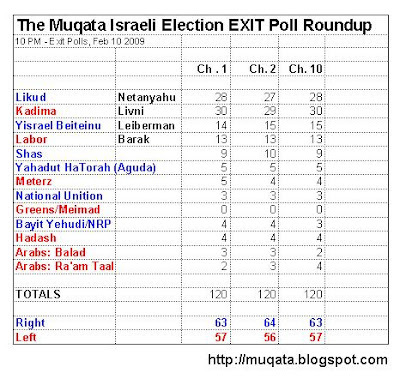 10:47 PM Slight Update on Exit Poll Roundup: Due to the expansion of the Arab party Balad and Raam Taal, the second graphic below's representation of the right/wing is slightly off (thanks to the commenter who noticed). 10:39 PM Update on Shooting attack: A passenger car was targeted by Terrorist gunfire near the town of Beit El in the Shomron/Binyamin region. Bullets damaged the car, yet no one was hurt. 10:36 PM Reports of Shooting/Terror attack in Beit El Area. All news sites reporting attack -- no details of wounded. 10:34 PM Breaking News: Terror attack in Beit El. Details to follow. 2. President Shimon Peres will then go from party to party and ask if they will form a government with the leader of the largest party (and if not, which leader would they follow). 3. Assuming it's Livni -- she will try to woo Leiberman into her government, meaning that the left would have a majority government. 4. If Leiberman holds strong, then the second largest party leader (Netanyahu) will be asked to form a government -- and since the Rightwing is larger than the left, its likely he'll succeed. 10:26 PM Disappointment in Likud -- only 1-2 seats would have meant the difference for a clear-cut victory. 10:18 PM Hamas Rocket lands in Western Negev about 15 minutes ago. No injuries, No Damage. Left Wing States: Tzippi Livni is the leader of Israel, since her party beat Likud by 1-2 seats. Irrelevant how many people voted Right Wing. 10:04 PM All Channels Point to a small lead of 1-2 seats for Kadima ahead of the Likud. The right wing leads by 65 - 55. 9:52 PM 8. Minutes. Remain. Till the polls close and the exit polls are announced. 9:07 PM Gut feeling results so far: Likud and Kadima neck and neck. Labour goes down to 14. Leiberman 18. National Union 7-8. Bayit Yehudi 2-3. Shas 8-9. Aguda 5.
note: these are unscientific results based on my reading of the internet, people Ive been talking to, and other media reports. 8:55 PM The polls will be closing at 10 PM, and at that time, the exit polls will be announced. Be here at the Muqata for all the exit poll results...political commentary...and more. 8:46 PM At the behest of her spin doctors, Tzippi Livni announced this evening at the Kadima party headquarters in Petach Tikva: "The leader of the party with the most mandates [seats] is the winner, with the trust of the public". 8:45 PM As of 8 PM, there was a 60% voter turnout which is very high. 6:38 PM Amnesty International reporting that since the pause in the Gaza war, Hamas troops (in Gaza) have killed scores of rival Fatah party members (including inside hospitals), and tortured many more. 6:30PM Voter turnout at 50.3% of eligible voters. Up 3% from the 2006 election at the same time of the day. 1. 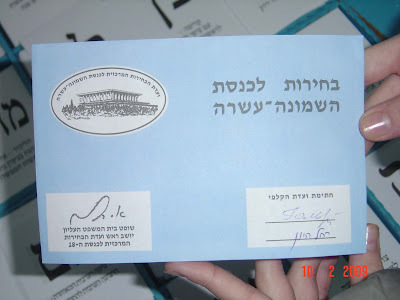 After presenting your Israeli ID to the local election board, you receive an official envelope. You go behind a cardboard/plastic "curtain" which is placed on a table, enclosing 3 sides. Its about 3 feet high, on top of a 3 foot high table. Behind the "plastic curtain" you are presented with little pieces of paper, with the "call letters" of all the parties running in the election, and their names. 2. You pick a piece of paper (one only) and place it in the envelope. 4. You walk back outside the plastic curtain, and there is a ballot box in front of the election board. Place your envelope in the box...and hope for the best. Ichud Leumi to get between 9-11 seats, Bayit HaYehudi doesn't pass minimum vote amount. 4:40 PM Please pardon the technical difficulties with the blog's banner. 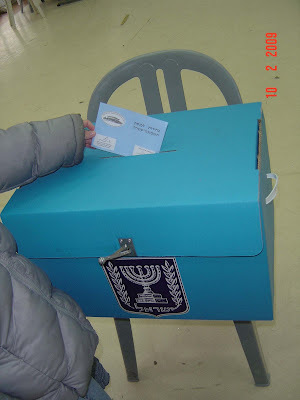 3:56 PM JoeSettler voted Ichud Leumi and convinced at least one other person to do the same. 2:31 PM Over 34% of eligible voters have exercised their right to vote. Reports of Police and Ultra Orthodox "radicals" clashing in Ramat Beit Shemesh. Details to follow. 2:27 PM On threat of being permanently banned from this blog, JoeSettler is "correcting" the special election banner ballot to a "question mark" instead of a vote for National Union/Ichud Leumi. (Besides that, thanks JoeSettler for the new banner). 1:22 PM 24.5% of eligible voters have voted so far. Election Committee considering extending voting time past 10 PM due to the very stormy weather. 12:37 PM 23.4% of eligible voters have voted so far. 12:35 PM National Union and Bayit Yehudi file complaints as their ballot tickets were missing from most polling stations in Bnei Brak. 12:11 PM In honor of Israel's election day, Google Israel's search engine web-page has a special graphic. Eldad has been safely escorted away from the city by police forces. 11:29 AM Israeli Arab rioters destroy fence around ballot location in Umm El Fahm, where National Union representative Aryeh Eldad was assigned as poll observer. A senior diplomat in the British Foreign Office has been arrested for inciting religious hatred after he launched into an anti-Semitic tirade at a London gym, the Daily Mail reported on Monday. Witnesses told the British newspaper they heard diplomat Rowan Laxton shouting "f**king Israelis, f**king Jews" while watching a TV report of Israel Defense Forces operations in Gaza from the seat of an exercise bike. He also reportedly shouted that IDF soldiers should be "wiped off the face of the Earth." In the first Hamas interview with the Western media since last month's ceasefire in Gaza, its deputy leader Musa Abu Marzouk told The Daily Telegraph that the Palestinian group was ready for a period of "calm". A chandeliered room in the Syrian capital Damascus - where several Hamas leaders live in exile - is a long way from the ruins of the Gaza Strip but a weary frustration with the deprivations of war was pervasive. "We need to rebuild the buildings destroyed in the aggression," said Mr Marzouk. "We need to treat the wounded - more than 5,000 need serious treatment. We need to help all the families without food and shelter. 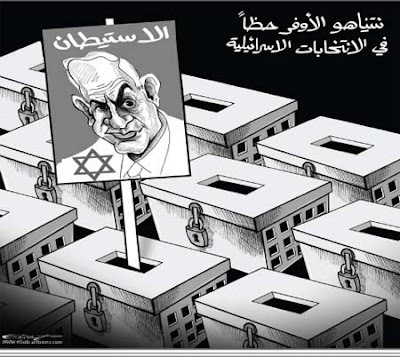 We need the gates of Gaza to open to lift the siege. "All this can only be dealt with by period of calm between the two sides." 10:30 AM Good Morning Israel! Its pouring rain in the hills of the Shomron...rain in the winter is always a good sign. Election updates and information coming soon. 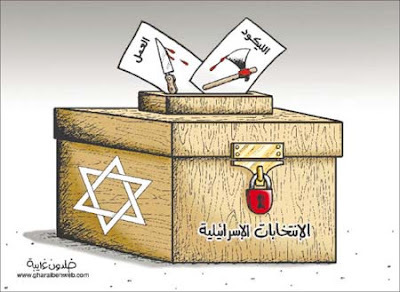 Elections are today, and democracy took its first hit of the day, as once again the Police caved into threats of Arab violence after they prohibited the officially appointed NU election monitor, Baruch Marzel, from reaching his polling station in Um el-Fahm due to threats of Arab violence. 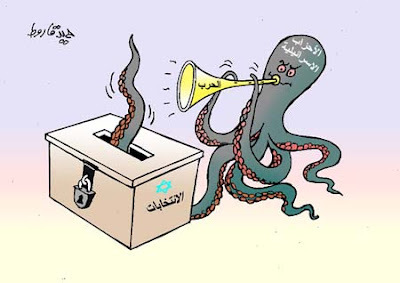 Um el-Fahm has a long history of severe vote fraud and ballot stuffing. 11:54 PM Stay tuned here tomorrow for up to date reports on Israel's elections. Good Night all - enjoy the rain, and make sure you get out and vote tomorrow! 11:15 PM Tomorrow's weather report is calling for extremely stormy weather, from snow in the Golan Heights, to flooding in the Northern Negev. IDF, Police and MDA are on high alert (I just picked up an ambulance for MDA as backup). Security officials worried about rocket strikes tomorrow from Gaza. 5:47 PM Channel 2 TV, Amit Segal wants to stay out of the morgue. As I have been vaguely reporting over the past few days, due to certain limitations beyond my control, Haaretz does the same thing in a longer article today. IAF officials said various factors, such as the limited number of aircraft and the enemy's increased capabilities, meant the force would likely not be able to repeat the largely successful model of cooperation with ground forces during Operation Cast Lead, on a broader scale, should the need arise. 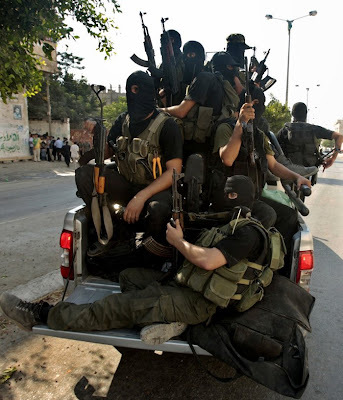 "Hezbollah and the Syrian army are not Hamas," a senior IAF officer said. "We cannot assume that things will be the same in a bigger war." During Operation Cast Lead the IAF implemented a number of changes that it learned from the Second Lebanon War in 2006. For instance, an air force liaison officer was assigned to every battalion and brigade. Liaisons coordinated evacuation of soldiers and strikes on targets on the ground. Also, every brigade was given an attack helicopter squadron capable of striking targets identified by troops on the ground. A commenter left a link with the following information from the Lebanon Now source, which I suspect is information not allowed to be published in Israel. This time around, the leading item on Assad's shopping list is thought to be the sophisticated S-300 long range anti-aircraft missile system. This state-of-the-art system has already been purchased from Russia by Iran. Iran is expected to deploy it by March, 2009. The Iranian intention, clearly, is for this system to be used in defense of Teheran's nuclear program. If this is the same system that iran just purchased, it is the S300 - PMU1 system and unless you have a very stealthy aircraft, it is impossible to break through. The more of them they get, the better the system is. not just because they have more missles, its because the radar system of each missle site communictes together forming a very broad shield. at the moment, the USA is the only country i know of that has an air force capable to defeat this system. and in 2010 Israel will get the f35 wich may be able to defeat the system too. Will the Likud be the second biggest party?